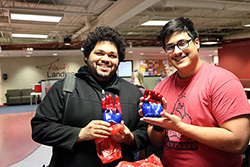 by amandab 2/4/2019 10:16:18 AM -- NORFOLK, NE - Divannte Edwards (left), Junction City, KS, and Josh Escamilla, Student Activities Council (SAC) vice president, David City, pose with their finished wax hand creations at a Wacky Wednesday event held at Northeast Community College in Norfolk recently. Approximately 80 students attended the event, which was organized by Erika Rupprecht, student activities coordinator, and sponsored by SAC. Students had the opportunity to dip their hands in wax to create a custom mold.